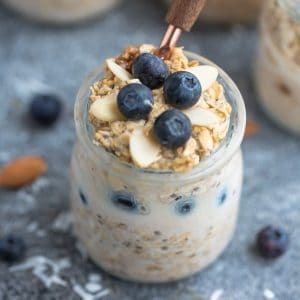 Blueberry Overnight Oats – the perfect easy make ahead no cook breakfast to enjoy for on the go. Best of all, gluten free and only 5 minutes of prep time. Add oats, milk, chia seeds, vanilla and blueberries (and sweetener if desired) together in a mason jar, resealable container or a bowl. (If you like your oatmeal more creamier, you can add more milk and less if you like them on the chunkier side - you can also add an extra 2 tablespoons yogurt (dairy free if needed) to make them creamier). Shake jar or mix and combine with a spoon. Seal and chill in fridge for at least 4 hours or overnight.